That’s 11 year old Jarvis Alatise’s daily routine which has made him one of the most skilled young football players in the country and now, the face of the FFS “FUN Football” program. A Year 6 student at Vaivase Primary School and the eldest of five kids, Jarvis started off playing tennis. He was exposed to the game of football at the age of seven when his father became a volunteer for the Just Play Grassroots programme. Armed with the Just Play teachers manual and equipment, Jarvis began to teach himself football techniques and skills and joined the Just Play program. It was there that he saw the opportunity to develop his football skills and decided to give up playing tennis to focus on football. Last year, he progressed to the FUN Football program where he continued to stand out with his impressive ability and skill so there was no hesitation in selecting Jarvis to star in the Fun Football TV commercial. “The Fun Football program allows young children aged 6 to 15 to further develop their technical skills and prepares them for the future”, states FFS Technical Development Officer Martin Tamasese. “Jarvis displays rare skills that only a few players in the Youth National League have so there was no doubt in my mind when we were searching for the most skilled football player to represent the younger Samoan generation in our TV commercial”. 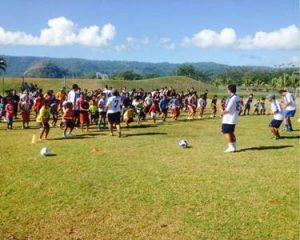 A key player for Faatoia in the FFS Youth National League, Jarvis is also involved in the FFS Centre of Excellence where talented players from the Youth All Star Tournament are selected by the FFS Technical Development team and are given extra training sessions to boost their skills and development. His dedication is unquestionable and his worn out football boots say it all. “I like to play football because I see a future for myself in this sport and I want to make my family proud”, says the keen youngster. “I give thanks to the Lord for blessing me with this talent and I pray it will lead to many opportunities within Samoa and abroad”.